Treating patients who have depression following a recent heart attack or unstable angina with escitalopram may reduce their risk of future cardiac events, according to a study published this week in JAMA. 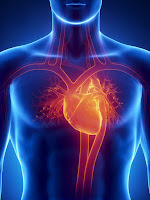 The findings come from a long-term follow-up study of 300 patients who were diagnosed with depression two to 12 weeks after acute coronary syndrome (ACS), which includes heart attacks and unstable angina. The study participants had received 24 weeks of escitalopram (flexibly dosed from 5 mg/day to 20 mg/day) or placebo. As was previously reported, 24 weeks of escitalopram was found to be superior to placebo at reducing depressive symptoms in these patients. During the eight-year follow-up of these patients, 61 (40.9%) in the escitalopram group and 81 (53.6%) in the placebo group experienced a major cardiac event, which was a statistically significant difference. The difference remained significant after the researchers excluded eight patients (five in the escitalopram group and three in the placebo group) who reported taking antidepressants for at least one year after ACS. When looking at individual cardiac events, the researchers also found a significant difference in heart attack incidence between the groups: 8.7% of patients in the escitalopram group had a heart attack compared with 15.2% in the placebo group. There were no significant differences in mortality between the groups, nor was there a difference in the occurrence of percutaneous coronary interventions (a procedure to open narrow arteries). To read more on this topic, see the Psychiatric News PsychoPharm article “Which Antidepressant Is Best for Patients With Coronary Artery Disease, Depression?” by Peter Shapiro, M.D.